Backwoodz Oddities Haunted House is a Haunted Attraction located in Waverly, OH. Team Mysterious Misery reviewed this Haunted Attraction on October 20, 2018. If you plug 832 Valley Road, Waverly, Ohio into your GPS and it’s your friend it will get you there with no problems. However, if it isn’t, your adventure will start deep onto dark country roads. You will reach Backwoodz Oddities: The Last Carnival which is a haunt that Alan Shell has been the owner and operator of for the past 8 years. With a steal of a price for admission, it makes it a haunt that is worth going to this season. This year the carnival has gotten longer and items have been enhanced because they want to keep you longer to extract the darkness from your soul. The Last Carnival is typically made up of 30 volunteers that provide fright for the night. These cast members will be very interactive with your group. We were pleased to see that they could hold entire conversations all while staying in character! One of the highlights is halfway through when you reach a point where one of the cast members looks over your whole group. If you get someone not scared in your group; they will call them out over a PA system with full details of what they look like, so the others can get ready for them. We did see a few dead spaces that we would have loved to see a warm body in, but we know that getting people to volunteer is no easy task nowadays. Some of our favorites that we hope you run into were Bro Pyro and the Voodoo Doctor. Alan Shell becomes a hands-on owner in this section. He wants each part of his team to become an oddity of the carnival. Alan does the majority of the makeup work on each of his creatures. He does very detailed work and some of the paint jobs are cool to look at. The masks that are used at The Last Carnival are few and far between. If they have a mask it usually coincides with airbrushed makeup to enhance the creature. The few masks we did see worked well with the scenes we found them in. One that stood out to us was the giant bunny. It was something simple but with a twist on it and in the right scene, it was very entertaining. Some of the cast lacked official, theme-oriented costumes and were in street clothes with minimal makeup. Some of this could be due to the job they have in the haunt, but we will be excited to see this addressed and the creativity that comes forward. If you are familiar with the area, you will find the haunt easier to locate. Our team was not from the area, so we relied on GPS which got us there. However, in years past, we have lost GPS signal, so an old-fashioned map may help you. Once you pull onto the street, you will notice it right away due to the number of cars and the fireballs being shot into the air. Parking is free but remember it is a muddy/grassy area and there’s not very much light out that way. Proper footwear and your flashlight on your phone will be two important pieces you will need for this haunt. Remember most of this attraction is outside so dress warm or you will regret it later. You will be able to recognize the staff that is not haunting easily. The haunt staff is professional and approachable. They are eager to share their haunt with you. They are always around if you have questions or a situation should something arise. You will see Alan, the owner, every night as he likes to know what’s going on with the haunt and is ready to take on any task that may arise. You can find any information you need on their Facebook or their website at www.BWOHaunt.com. If you can’t find what you are looking for, send them a message and they will get back to you. When you pull up to the haunt, you will know you have reached your destination by the plethora of cars in the yards. You will also see the carnival tent and the fireballs the occasionally erupt into the sky. You will reach the ticket and queue line area and that’s when the fun begins. ‘When you’re in the line you get to see the exit where people come running out in fear and screaming. As a veteran team, I could have put a lawn chair right there and watched the reactions all night. The big clown was out and about as well as a few of the other oddities making their presence known through the line. There is nothing quite like a small haunt with an outdoor queue line that provides entertainment. For a smaller haunt, Backwoodz Oddities: The Last Carnival has some very cool special effects! Most of the effects have been created by Alan and his team. They pride themselves on not being a store-bought haunt. Alan hand painted the 3-D, blacklight scenes himself. Even though we have seen this utilized in other haunts, it was refreshing to see the creativity of the spinning floor. Let’s just say when you get to here, I hope you are ready. We have also seen the laser swamps many times this year, but again, they do it differently here. Their laser swamp was red to fit the theming of the scene and they didn’t use it like a traditional swamp. The fireballs that the Voodoo doctor has are neat to watch erupt in the sky. The trail itself becomes a special effect when you figure it out. I am a fan of playing with the Ouija board and guessing if it moves on its own or someone else is doing it; there is not guessing with the one we seen at this haunt. The creativity and details in most of the scenes are done very well, helping to enhance all of the special effects. The effects are well thought out in this haunt. 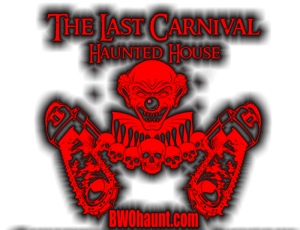 Backwoodz Oddities: The Last Carnival is just that, a haunt based on a carnival. Most of the haunt fits in with the theme and does a great job with it overall. There are a few scenes that could be revamped a little to make the theme fit better. There are a few scenes I think should be replaced as I didn’t think they fit very well. Erasmus takes pride in his unusual carnival. This carnival has been moving around small towns for over 150 years. Erasmus has lost count of the people coming for entertainment but have never made it out. The darkness of a human soul is what fuels the carnival and everyone, even you, have darkness. We enjoyed our time at Backwoodz Oddities: The Last Carnival. If you are a haunt enthusiast, like us, you will be entertained. There’s nothing like starting your night off in the backwoods where your GPS doesn’t reach. Deep into the woods is where you will go to start your adventure. There will be clowns, fortune tellers, and voodoo doctors waiting for you and making up the creepy story of the carnival. After you make your way through this haunt I promise you will never want to see the #2 again. Just when you think you have this haunt figured out, guess again because the ways to get out are usually hidden. This haunt utilizes distractions very well and that keeps you on your toes. They provide fright for everyone not just the easy targets. As mentioned above, when you think you are tough you will reach a special place where they will call you out on the loudspeaker. If they don’t manage to scare you after this, they may at least take you out of your comfort zone. We did not come across one prop that wasn’t working or that was off on timing. One thing we did run into was other groups who were scared that would run and catch up with us. The haunt usually does a good job at trying to hold you in distinct areas to space out the groups better. Backwoodz Oddities: The Last Carnival is a steal. Tickets are $10 and available online or at the ticket counter. It took our self-guided group about 30 minutes to make our way through the trail. That gives you three minutes of entertainment for every dollar you spend, which is crazy! It could take you longer if you can figure out the puzzles with #2 making your night even longer. They also keep you busy in line but letting you get up close and personal with the oddities. The night we attended the ticket line was long, so be prepared and dress to be waiting outside.